Avant Browser is an ultra-fast web browser. Its user-friendly interface brings a new level of clarity and efficiency to your browsing experience, and frequent upgrades have steadily improved its reliability. 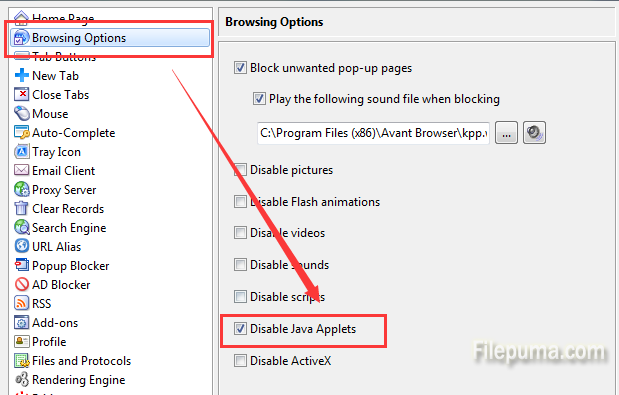 Here is the instruction to tell you how to disable Java Applets in the Avant Browser. 2. Click the “Browsing Options” tab, then check the “Disable Java Applets” icon. 3. Click “OK” to save your settings. 4. Restart your browser by closing and reopening it to apply the setting.